Few of us have been unaffected by the fears of Swine Flu. Any public health organisation would need to model an epidemic so that it can be prepared and can take preventive or precautionary actions. In this article, you will see how Scipy can be used to model an epidemic using the simple SIR model. If the factors, b and k, are known and initial values of susceptible, infected and recovered populations are known, the above equations can be integrated and a solution found. Suppose ten people in a city of a million people are infected. The infectious period of a flu typically lasts for 5 days; so, an estimated 20% of the infected cases recover each day. Usually, the values of s, i and r are normalised so that the sum of the three is 1. In this case, the ratio of b/k is indicative of the number of people infected by an infected person. Assuming that each infected person infects another 2, what will happen in the next 100 days? 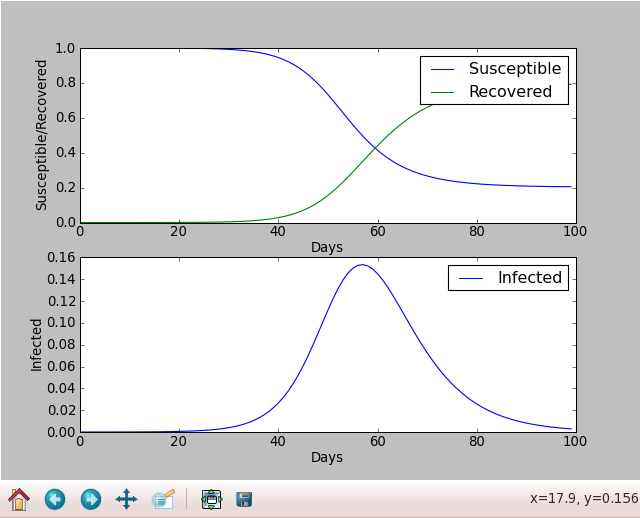 The scipy package includes an integrate module, which can be used to compute the susceptible, infected and recovered populations for each succeeding day for as many days as needed. You define a method dif_eq which computes the derivatives for the system of differential equation. The parameters to this method are an array containing the current values, the current time and additional arguments, b and k in this case. The key method is odeint whose parameters are a function defining the differential equations e.g. dif_eq above, a list containing the initial values, a time array at which solutions need to be found and any additional arguments to the dif_eq	function. The best way to observe the results is graphically. It is at times easier to show sub-plots. In the example above, A plot with 2 rows and 1 column is created. In the first row, a sub-plot shows the the susceptible and recovered populations. The second sub-plot shows the infected population. The result is shown in Figure 1. The infections peak about 60 days after the outbreak and the maximum people infected at one time is about 16%, which is 160,000 in a population of a million! Suppose a third of the infected population is quarantined. Add the code and call the plot routine. The modified graph routine shows the infected populations with and without vaccination. The results are shown in Figure 2. The infections now peak at 4% about 70 days after the outbreak. 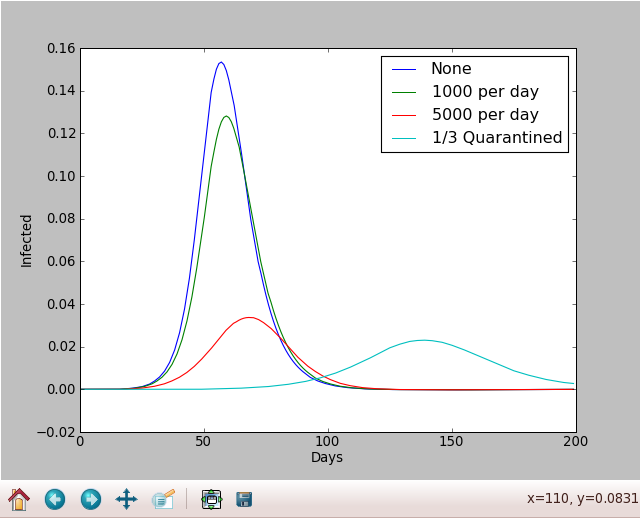 The effect of quarantine is dramatic even with only a third of the infected population isolated. The intention of the above examples is to show the ease with which various models can be created and impact analysed. Strategies can be implemented and monitored. The effort is not in coding. It is in developing models which can be verified by observations. The model can be enhanced to include births, deaths and disease induced mortalities and much more as shown in the second reference. The concept of viruses has been applied to ideas(meme), computer malware, viral marketing etc. An interesting example is an application to the modelling of a zombie attack - http://www.wired.com/wiredscience/2009/08/zombies/ and http://www.mathstat.uottawa.ca/~rsmith/Zombies.pdf . With the scipy integrate module, you are not just restricted to understanding the dynamics of viruses and their impact on humans. Another very important model in biological systems is the predator-prey model. You can find a tutorial about using the scipy integrate module to solve those equations here: http://www.scipy.org/LoktaVolterraTutorial. Furthermore, pyplot offers tremendous versatility and flexibility in presenting the results so that they can attract attention and quickly convey the desired information.